Twenty-two years ago today, I received my lay off notice at Fujitsu Microelectronics, Inc. in San Jose, CA. I worked as a product marketing engineer for 8 years. Little did I know how my life would pan out from there. Our son, Scott was only 10 months old, my wife was a stay at home mom, and we were closing escrow the following day on our home. I will always remember the letter that was handed to me that fateful day. The salutation read: ” To those eligible for our termination program.” I can laugh about it now. Termination program? Eligible? I spent a year trying to get back into the same line of work. There was more competition since I landed my first high-tech job in 1978. For awhile I worked part time at an event management company booking and organizing corporate events and p rivate parties. This lasted for about a year and a half. 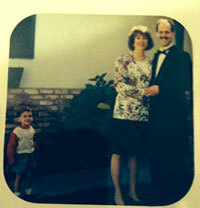 Then in January 1995, I decided to devote all my time to marketing and promoting myself. And I’ve never had to look back. It’s been a fun and wild ride. Scary at times too. But, I have to give all the credit to my wife, Terry for her support, for believing in me and for going back to full-time work so that we could get health benefits. Our son is going to turn 23 years old in October. And we are in the same house. Not everyone can follow their passion. But, I guess I’m one lucky guy. Ok, I’ll say this here so that you can hold me to it. I am going to write my book about my career in magic and to help those that are coming into this profession. It’s my way of giving back to my magic community and to say thanks to those that have helped me.